Progress is being made in drips and drabs. In my last post I reviewed my day of wood butchery. I’m happy to report that my repairs were successful and the split tops are once again solid. The second round of assembly went without incident and all four trestles are together. 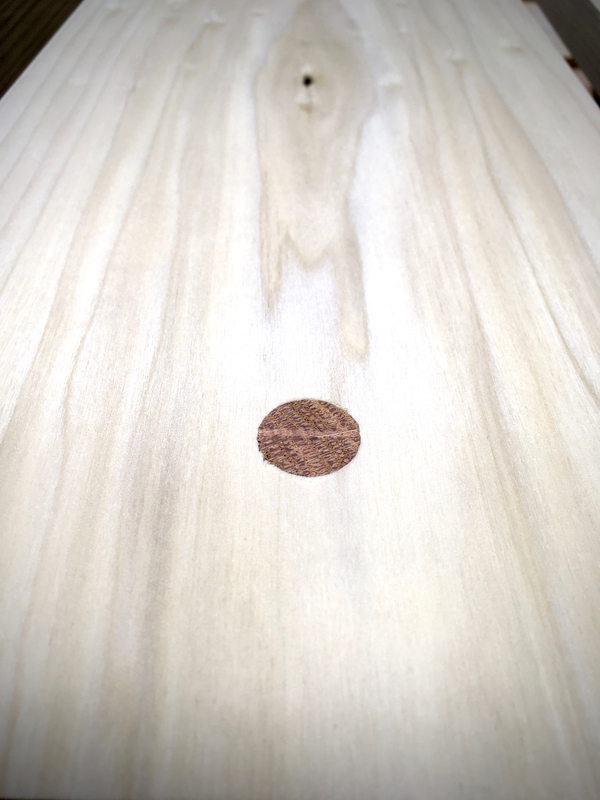 Once the glue dried, the next step was to trim the tenon stubs and clean the tops up with a plane. The point being is that I needed the thickness of the table top to accurately trim the height of the trestles. After a lot of back and forth I settled on using 2x SYP for my table tops. 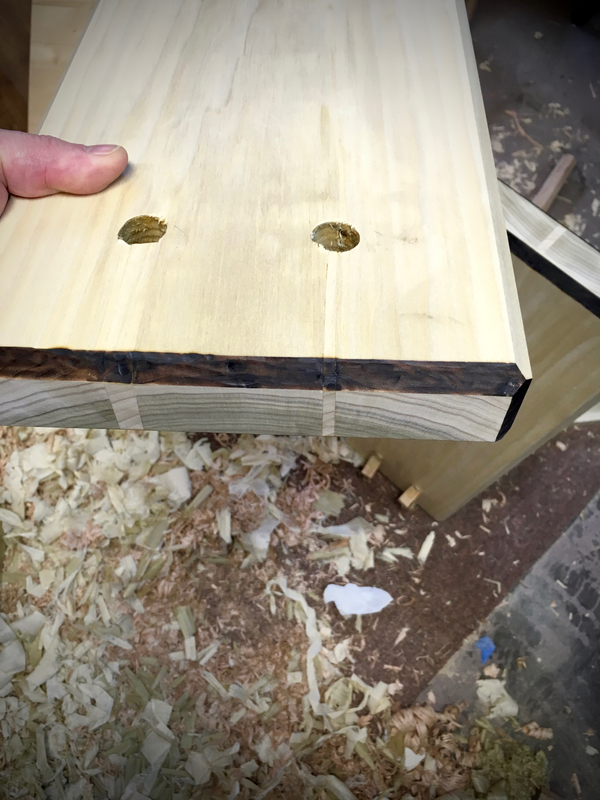 These tops should finish out at 36mm(1-7/16″). 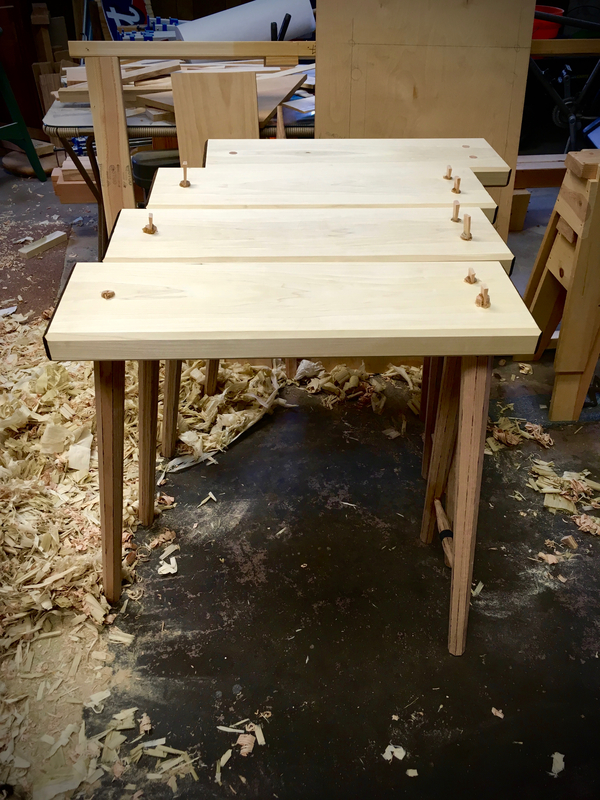 To mark the legs I tried a method exampled in Peter Galbert’s book, “A Chairmaker’s Notebook“. 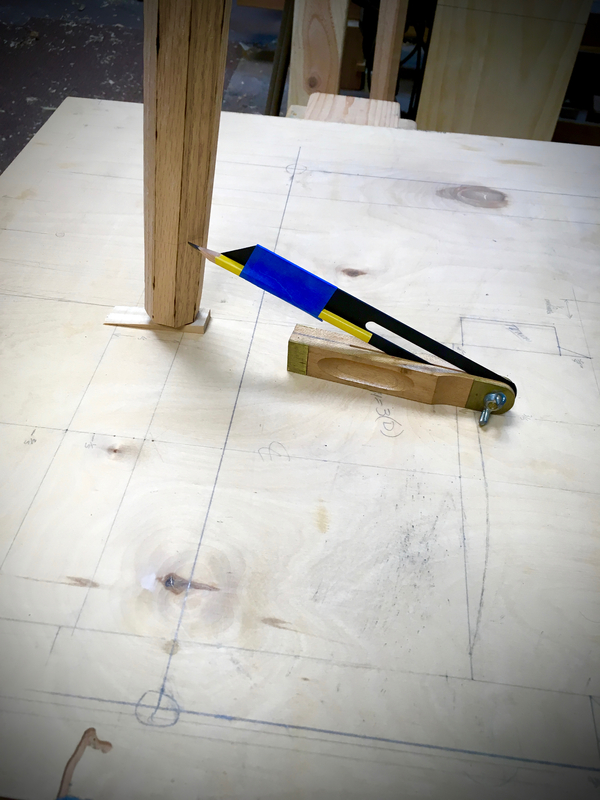 The method is to tape a pencil to a bevel gauge. This gives a pretty easy of way of adjusting the height and marking the legs. Once I shimmed a trestle level I measured the distance from ground to the top of the trestle. Then added the top thickness to that distance. From that I subtracted my desired finished table height. The remainder being the amount of leg to be trimmed away. Once I had all of the trestles trimmed, I moved them onto the sun porch so I would have room to work in the shop without fear of damaging them. The trestles are not quite complete at this point, but the remaining work is dependent upon them being mated to the tops. Which brings me to the tops themselves. 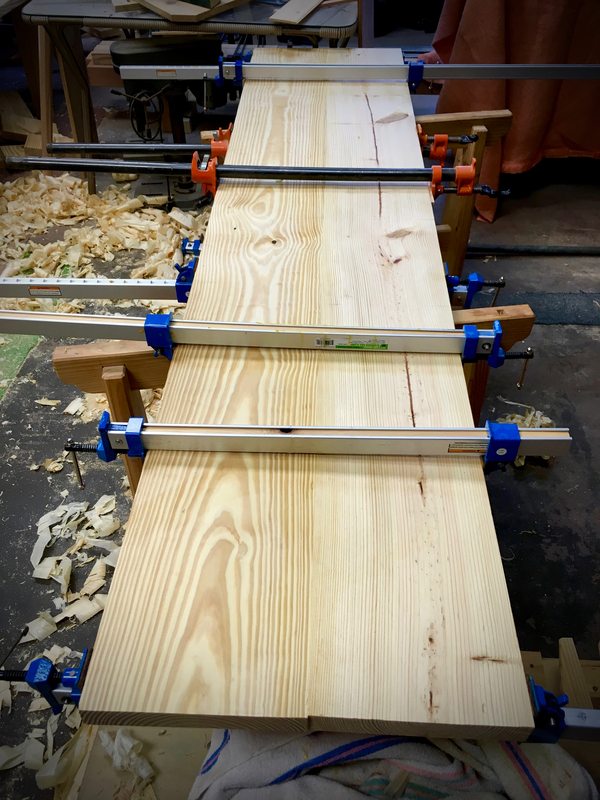 As I said earlier, I’m making these tops from 2x SYP construction lumber. I waffled on this decision quite a bit. A 2x top is heavy, but durable. A 1x top would be lighter, but lacking in durability. 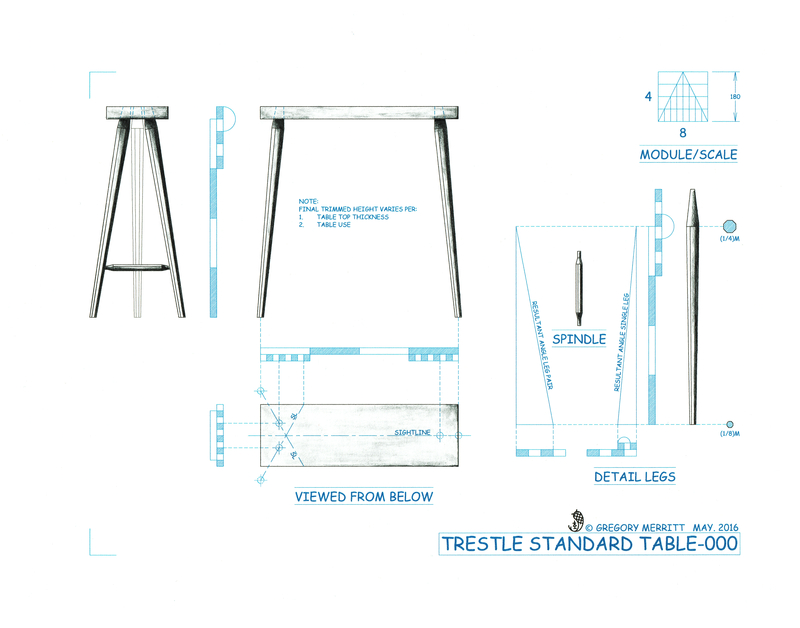 Either would work for dinning, but I know that these tables will be used for much more than simple dinning. 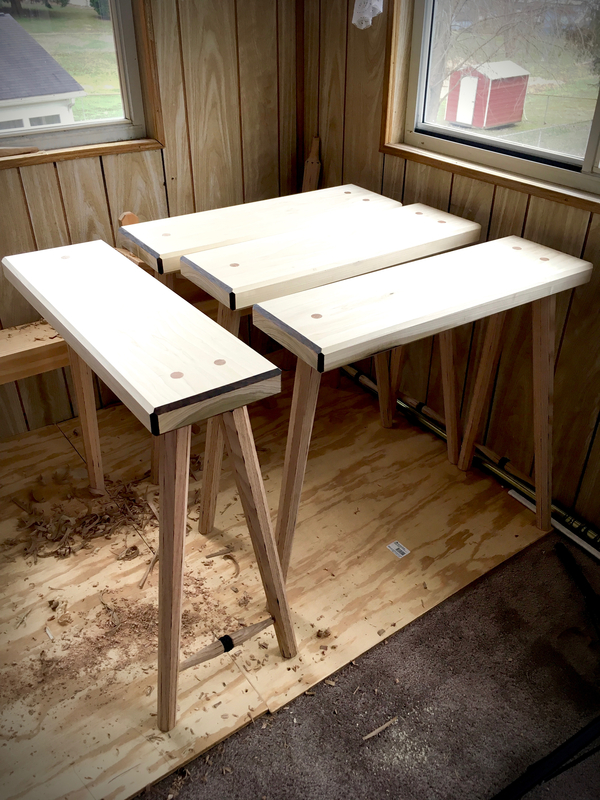 The “extra” table will spend most of its life as a craft/work table out on the sun porch or wherever it may be needed. I went to the big box store in hopes of purchasing 2×12 lumber. Three 2x12s would be enough for each top. However, the offerings of 2×12 were pretty sad. Boards that were full of knots, cups and twists. The 2×10 offerings yielded a much better material and that is what I loaded into the truck. 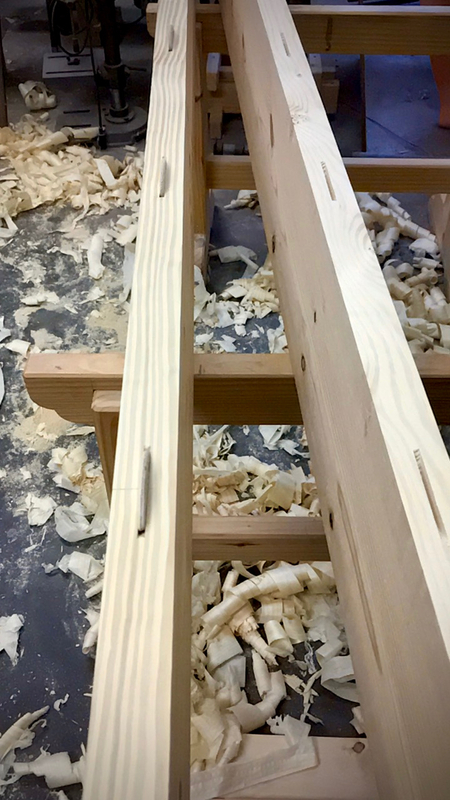 Four 2x10s will make up each top with plenty of width to trim to final size. These four will make up the better of the two tops and will be used on our daily dinning table. The other four pieces are a little more rugged, but not by much. 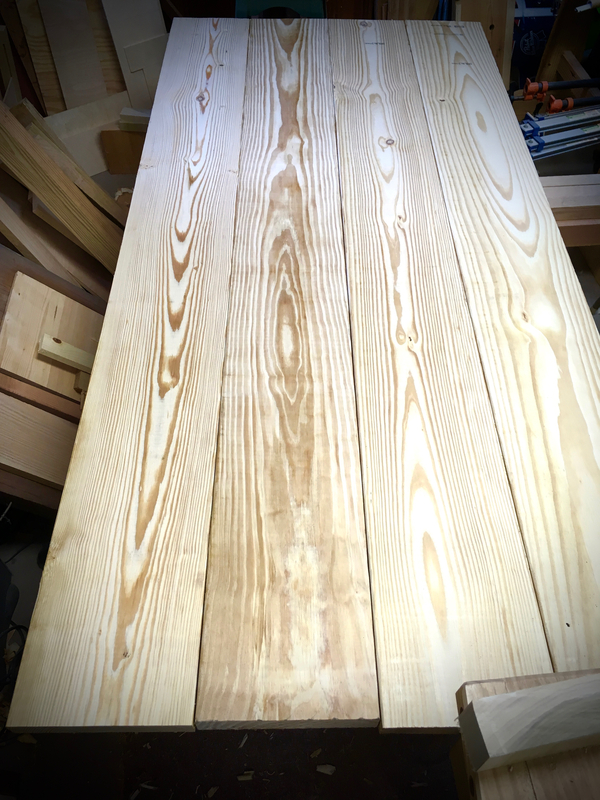 The first task was to cut all of the boards to rough length. To edge glue these boards together I need to plane one face true being sure to check for any twist. Then square both of the edges to that face. It’s a fair amount of work with hand planes and I decided from the start to tackle these in stages. I’ll surface and joint two boards and glue them together. This will eventually yield four two-board panels. Then I’ll joint and glue two of those panels together to create a table top. Much easier for a one-man shop than trying to tackle them all at once. The result of working on two boards. I’m using biscuits to aid in aligning the boards. Two boards glued and in the clamps. I’ll just keep plugging away at the remainder of the boards until I’m done. This entry was posted in Table Trestles and tagged clamps, glued panel. Bookmark the permalink. Good looking stuff, Greg. You never know what you’re going to get with the 2x wood. I hope you get them to cooperate well enough to get a reasonably flat top (that will stay flat). It is always a gamble. I’ll do the best I can up front. If it moves over time I’ll plane it flat again. Worst case is I’ll have to scrap it and start over. These have been in the shop for a couple of weeks and it will be a couple of weeks more before they are table tops. Hopefully most of the movement is out of them by then. Greg, where did you wind up for sitting and dining heights? I find that 28.5″ dining and 17.5″ sitting are pretty ideal for me. I actually prefer knees and hips at the same height to remove the pressure from the hamstring while sitting. 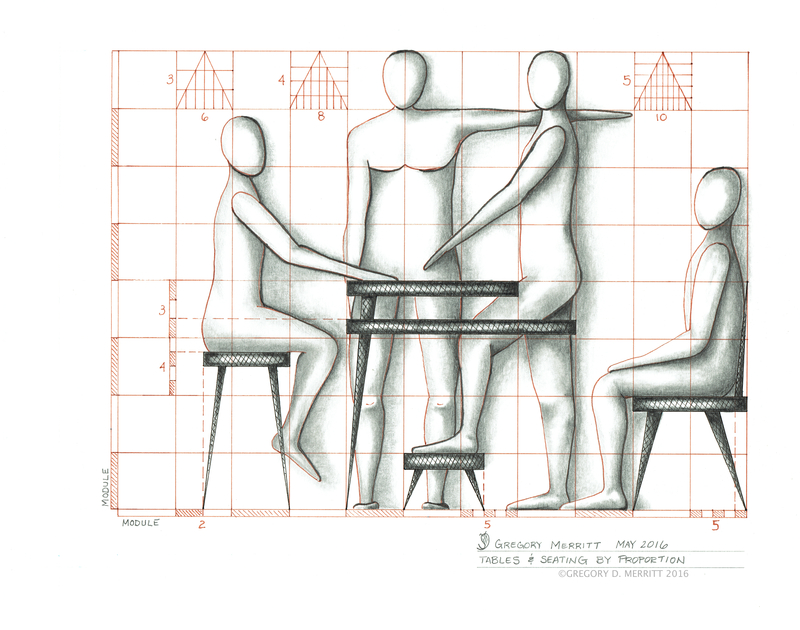 Your drawing has the essence of a Le Corbusier human proportion drawing, it’s very cool. If I do the math, sitting works out to be 222mm(17.48″) and dinning is 740mm(29.13″). So we are really close in our findings. I’m 5’10” tall. I’m still working on what sort of drop, if any, front to back on a chair is most comfortable for me. The carving and hollowing of the seat plays a big role in that. I cheat that a bit by measuring, instead, the angle at which the seat is tilted back. For dining it can be small, like 3-5 degrees where lounging is usually 7-10 degrees . I think Le Corbusier was working out a system which could easily be given to his staff and worked out. Just trying to make your life easier Antonio…LOL..
What lovely SYP you chose. I think happiness is finding decent lumber at the Borg. Sometimes I get lucky. 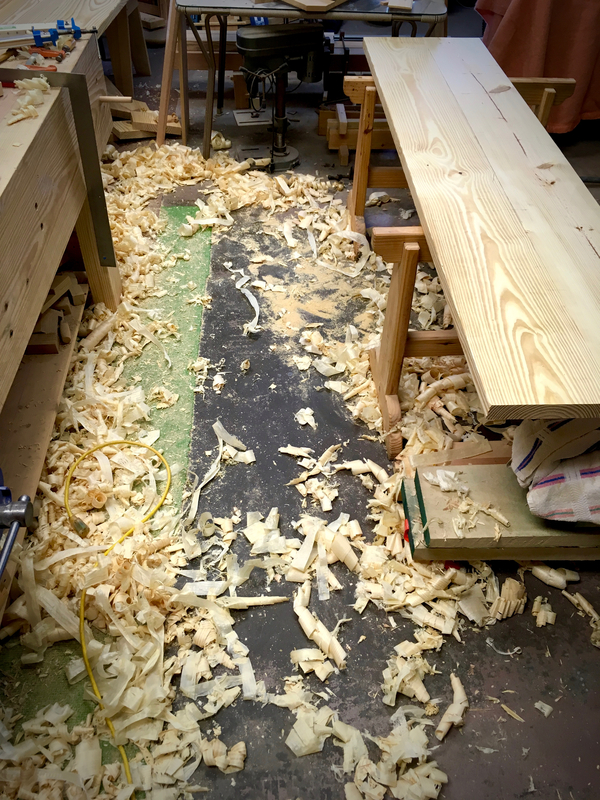 Finding decent lumber is almost as fun as watching the Borg monkeys lose their minds while I dismantle an entire stack of lumber…I always neatly put everything back though. Haha! I do the same. First time I noticed that you have 3 legs! Quite some time ago I too made a set of small tables with three legs and got some flak about them, I called it TV Tray Redux and they work great. Not as tall as yours but remarkably stable — really nice work Greg!